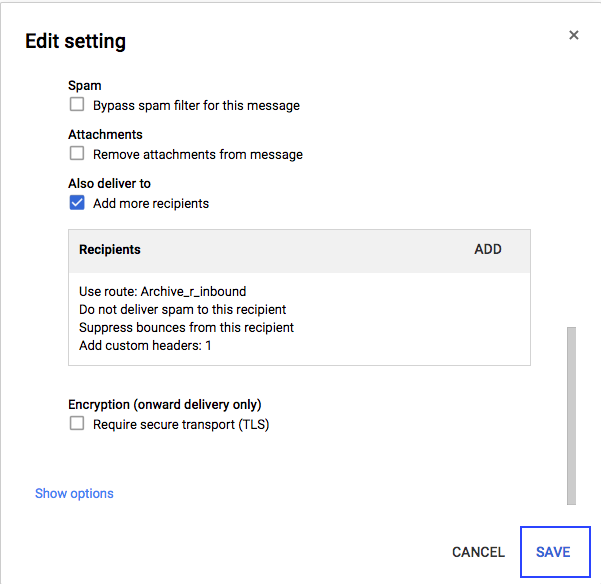 This article consists of the instructions on how to correctly setup HENNGE Email Archive so that it is fully functional within your G Suite domain environment. After completing this setup, you will be able to start using the features of HENNGE Email Archive. For the set values, please see your Connection Settings document that we have provided. 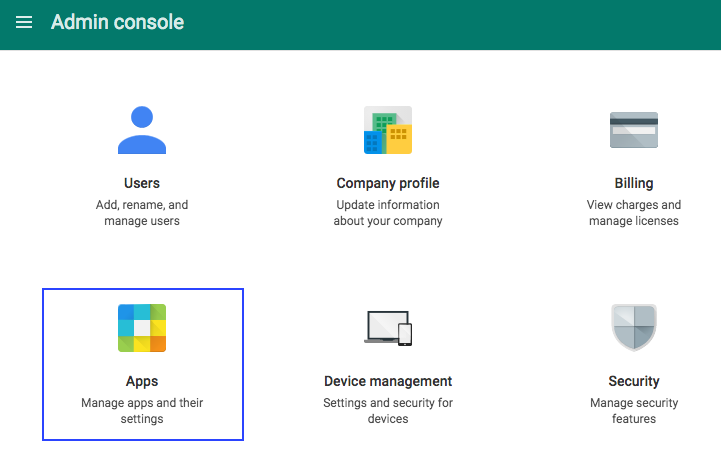 Step 1 - Log in to your Google Admin Console. Step 2 - In the Admin Console interface, click on "Apps". 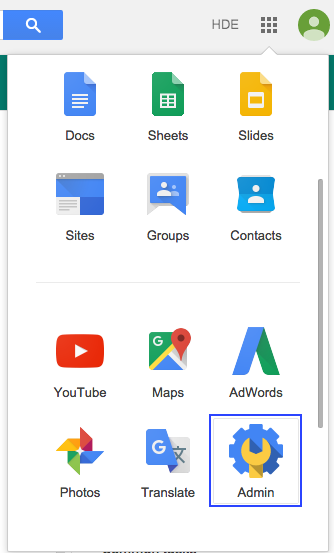 Step 3 - In the "Apps" interface, click on "G Suite". 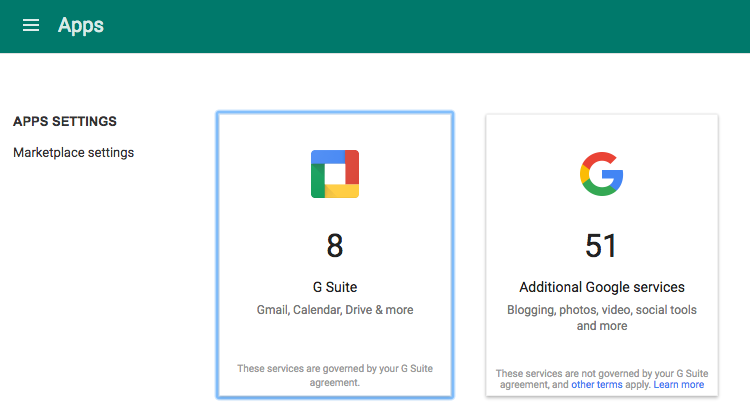 Step 4 - In the G Suite interface, click on "Gmail". Step 5 - In the "Settings for Gmail", click on "Advanced settings". Step 6 - In the "Advanced settings" interface, switch from "General Settings" to "Hosts" tab. In the "Hosts" interface, click on "ADD ROUTE". Step 7 - Please name this mail route as "Archive_r_inbound". For the email server, select "Single Host" as the server type and enter "in.r01.hdems.com" and input "25" for the allowed port. 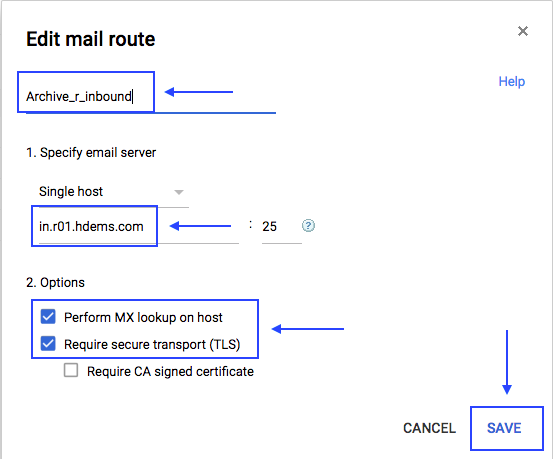 Check the options "Perform MX lookup on host" and "Require secure transport (TLS)". Click "Save" to finish this step. 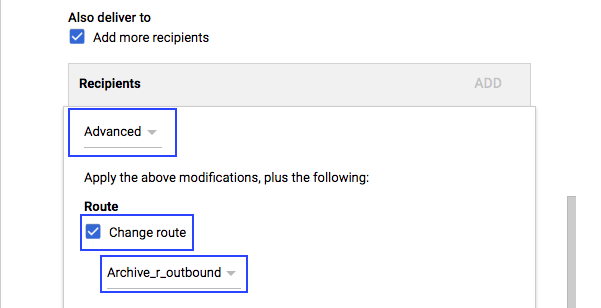 Step 8 - Please name this mail route as "Archive_r_outbound". For the email server, select "Single Host" as the server type and enter "out.r01.hdems.jp" and input "25" for the allowed port. Check the options "Perform MX lookup on host" and "Require secure transport (TLS)". Click "Save" to finish this step. Step 9 - Please name this mail route as "Archive_b_inbound". For the email server, select "Single Host" as the server type and enter "in.r02.hdems.jp" and input "25" for the allowed port. 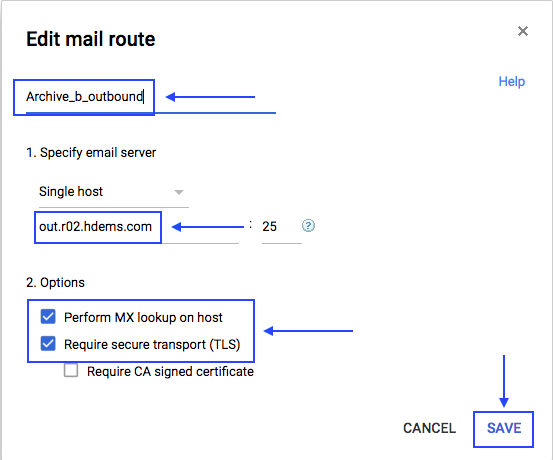 Check the options "Perform MX lookup on host" and "Require secure transport (TLS)". Click "Save" to finish this step. 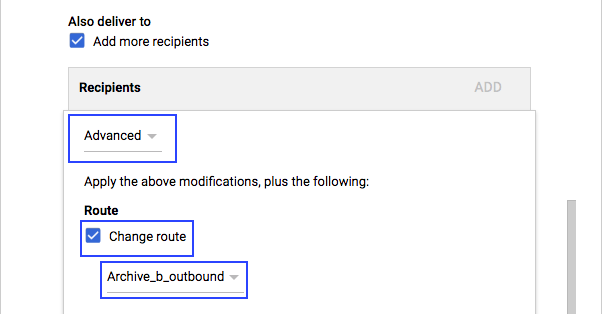 Step 10 - Please name this mail route as "Archive_b_outbound". For the email server, select "Single Host" as the server type and enter "out.r02.hdems.jp" and input "25" for the allowed port. 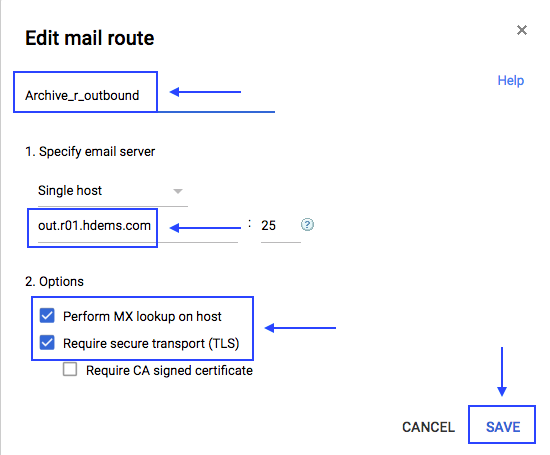 Check the options "Perform MX lookup on host" and "Require secure transport (TLS)". Click "Save" to finish this step. Step 1 - In the "Advanced settings", switch to "General Settings" tab. Scroll down to "Routing" section and click "CONFIGURE" for "Receiving routing". 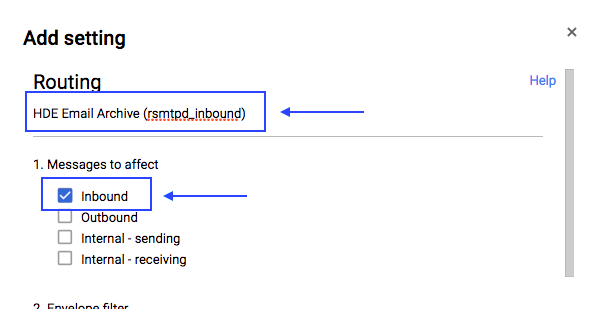 Step 2 - Please name this new sending routing as "HENNGE Email Archive (rsmtpd_inbound)" and check "Inbound" option. Step 3 - Scroll down to "Also deliver to", check the "Add more recipients option" and click "ADD" to add recipients. Step 4 - First select "Advanced", check the "Change route" option and select "Archive_r_inbound" as the route. 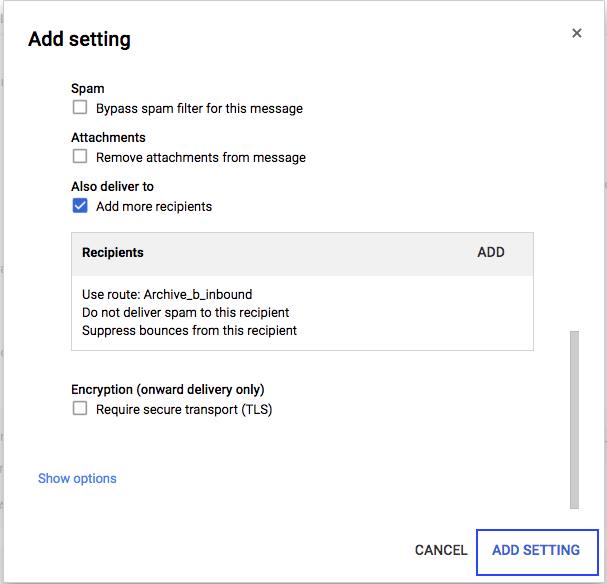 Step 5 - Ensure that both the "Do not deliver spam to this recipient" and "Suppress bounces from this recipient" options are checked". After that, click "Save". 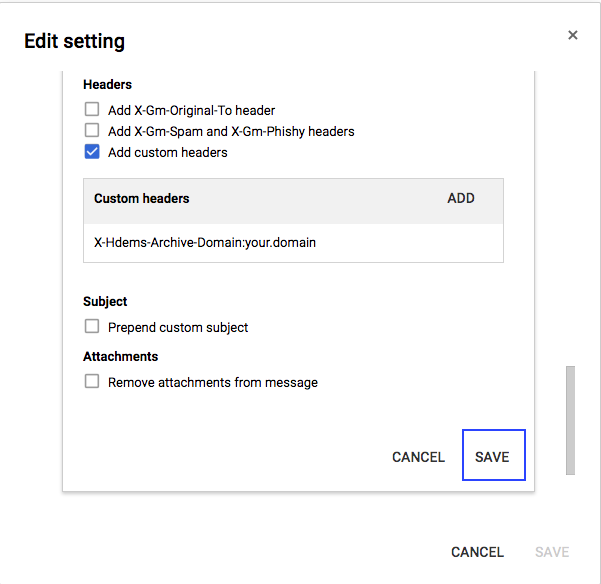 Step 6 - Check on "Add custom headers" and input "Hdems-Archive-Domain" beside the X- field, replace "your.domain" with the parameter in your connection settings file and click on "Save". Step 7 - After saving, click on "Save" again to save the Recipient. Step 8 - Click on "Save" once more to save the Routing. Step 9 - Please click on "Add Another" to add one more Routing. 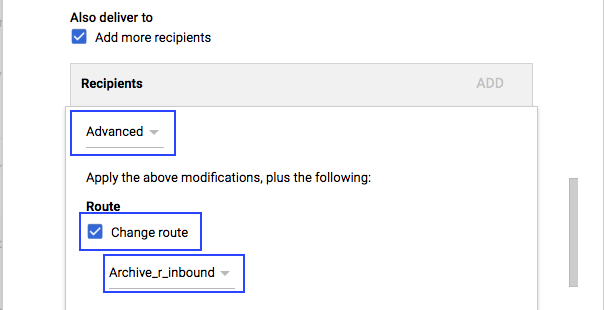 Step 10 - Please name this new sending routing as "HENNGE Email Archive (rsmtpd_outbound)" and check "Outbound" and the "Internal - sending" option. Step 11 - Scroll down to "Also deliver to", check the "Add more recipients option" and click "ADD" to add recipients. Step 12 - First select "Advanced", check the "Change route" option and select "Archive_r_outbound" as the route. Step 13 - Ensure that both the "Do not deliver spam to this recipient" and "Suppress bounces from this recipient" options are checked". After that, click "Save". Step 14 - Check on "Add custom headers" and input "Hdems-Archive-Domain" beside the X- field, replace "your.domain" with the parameter in your connection settings file and click on "Save". Step 15 - After saving, click on "Save" again to save the Recipient. Step 16 - After saving, click on "Add Setting" to save the Recipient. Step 17 - Please click on "Add Another" to add one more Routing. 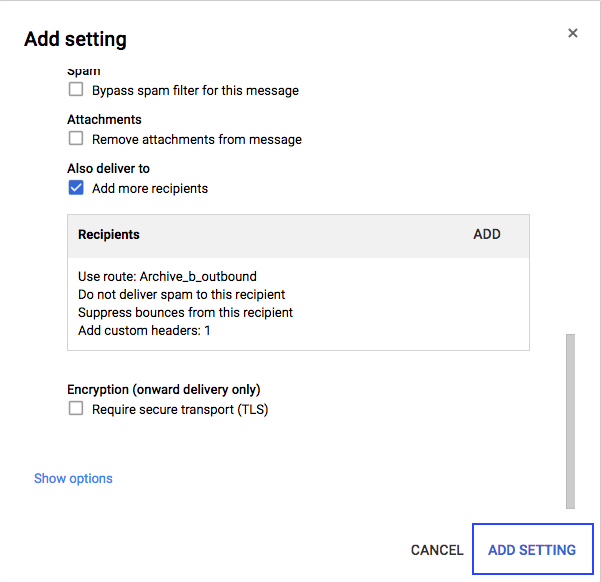 Step 18 - Please name this new sending routing as "HENNGE Email Archive (bsmtpd_inbound)" and check the "Inbound" option. Step 19 - Scroll down to "Also deliver to", check the "Add more recipients option" and click "ADD" to add recipients. Step 20 - First select "Advanced", check the "Change route" option and select "Archive_b_inbound" as the route. 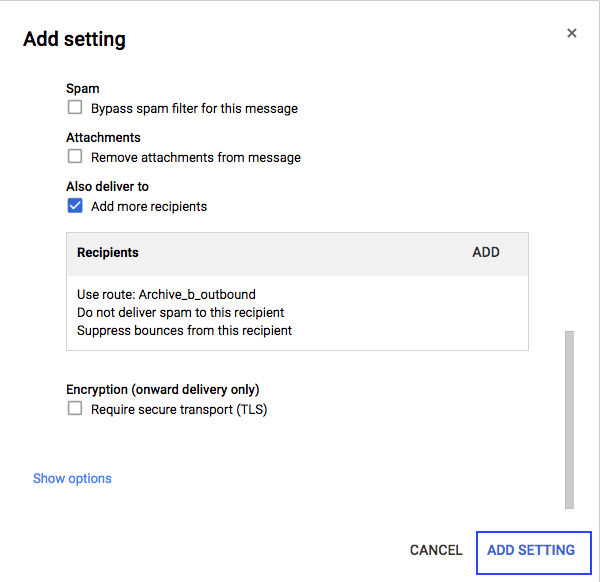 Step 21 - Ensure that both the "Do not deliver spam to this recipient" and "Suppress bounces from this recipient" options are checked". After that, click "Save". Step 22 - Check on "Add custom headers" and input "Hdems-Archive-Domain" beside the X- field, replace "your.domain" with the parameter in your connection settings file and click on "Save". Step 23 - After saving, click on "Save" again to save the Recipient. Step 24 - After saving, click on "Add Setting" to save the Recipient. Step 25 - Please click on "Add Another" to add one more Routing. 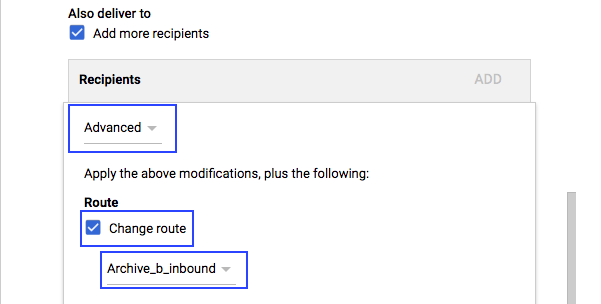 Step 26 - Please name this new sending routing as "HENNGE Email Archive (bsmtpd_outbound)" and check the "Outbound" and the "Internal - sending" option. Step 27 - Scroll down to "Also deliver to", check the "Add more recipients option" and click "ADD" to add recipients. Step 28 - First select "Advanced", check the "Change route" option and select "Archive_b_outbound" as the route. Step 29- Ensure that both the "Do not deliver spam to this recipient" and "Suppress bounces from this recipient" options are checked". After that, click "Save". Step 30 - Check on "Add custom headers" and input "Hdems-Archive-Domain" beside the X- field, replace "your.domain" with the parameter in your connection settings file and click on "Save". Step 31 - After saving, click on "Save" again to save the Recipient. Step 32 - After saving, click on "Add Setting" to save the Recipient. Step 33 - After the all four Routing settings have been added, click "Save" as shown below to complete the settings.